Cosmic ConneXion is an entertaining and educational word search card game created to familiarize players with the Greek alphabet and objects of the cosmos. 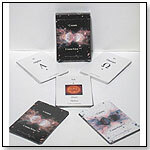 The deck consists of 2 sets of cards, letter cards and celestial point value cards. The letter cards consist of all 24 letters of the Greek alphabet from Alpha to Omega. Each letter card displays the name, uppercase & lowercase Greek letter, along with English equivalents and variants. The letter cards are played in a diamond arrangement to create words. The celestial point value cards consist of 28 objects of the cosmos from our local solar system to the constellations of the zodiac along with wild cards of the cosmos. For each word formed, a player acquires a celestial point value card from the draw pile. The object of the game is to acquire as many celestial point value cards as possible. However, after all the letter cards have been played, the player who has acquired the sun card during regular play has a final opportunity to score additional points during the bonus round by forming a grammatically correct sentence from the words formed during regular play. The player with the highest point value wins. "The greatest benefit of playing games with these cards is to increase player's familiarity with the Greek alphabet. The Greek alphabet is widely utilized in many fields of math & science, yet not widely recognized to the general public," Joseph Bongiorno, president of N.E.T. & Computing, told TDmonthly. Launch date: October 2011.